The regular international student lunch on campus at Casuarina throbbed to the sound of West African drumming on Thursday (April 5). Demonstrating his skills on the djembe was Mali-born exponent Mady Keita, who is on a three-week drumming journey through Darwin’s music venues. Now based in Melbourne, Mr Keita is a professional African drummer, conducting workshops with children and adults in the cities and regional towns he visits. He was invited to Darwin by CDU language teacher Anne Harkin, a keen drummer who joined with the International students in giving an impromptu percussion concert during lunchtime in Student Square. 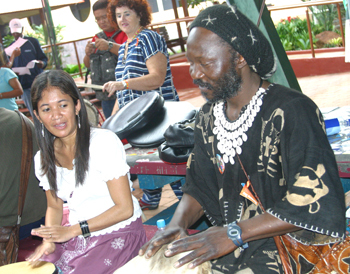 While in Darwin Mr Keita will give classes in the djembe and other styles of West African drumming at the African Lounge in suburban Marrara.